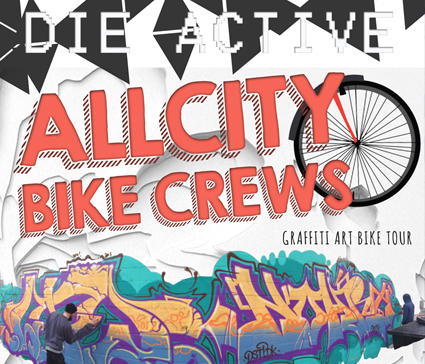 Die Active’s first ever graffiti art bike tour! boomboxes, graffiti, free snacks & gang style riding. welcome to summer. Bring your wheels/helmet and start at defsup at 1:00. Come down early to get your “jiffy-tune-up” done on your bike courtesy of Petrie’s! The ride will be led by Petries Cycle and Sports & Community Spokes Bicycle Collective. It should take an hour but with some awesome stops along the way. Prizes to be won as well! Kicking DiE AcTive season 5 into gear for National Youth Arts Week.